La Meridiana is a top quality agriturismo resort conveniently near to the city of Rome, and to both of its airports; Ciampino & Leonardo da Vinci. The building is a classic, rustic, Italian farmhouse with ivy covered walls, and though updated for the modern age it still retains a lovely traditional feel. The grounds are lovely too with large, beautifully tended gardens & lawns, an outdoor swimming pool, tennis courts and the farm’s own vineyards, vegetable gardens, citrus and olive groves from which they make, amongst other things, their own wine, and olive oil. Last but not least they have an excellent restaurant here which serves up some lavish traditional meals with much of the ingredients being home grown. Their hotel standard rooms all have WiFi, air-con, mini bar and en-suite bathroom and all are nicely decorated in traditional Italian farmhouse style with some nice quirky little touches here and there. 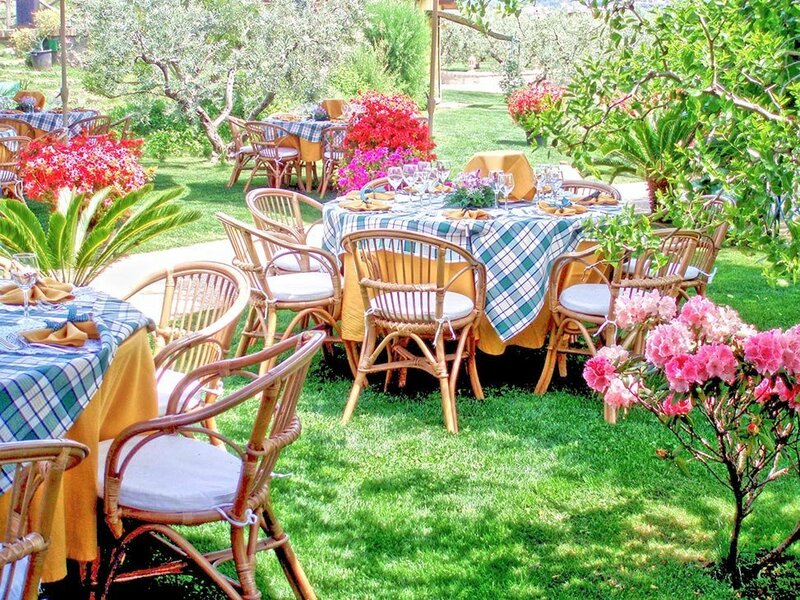 The large grounds are a highlight at this agriturismo, you can spend all day wandering around the gardens and farm, relaxing on the lawns, having a dip in pool or enjoying a game of tennis. Kids can also be suitably entertained at their, well more than average, children’s playground. As mentioned above the food here is excellent, breakfast to begin with (all the rooms are B&B), and some long, leisurely, evening meals where you can also sample some of their own wine. For visitors coming from, or to going to, Rome La Meridiana can be a very nice introduction to the Italian agriturimso concept and is an oasis of calm compared to the bustle of the country’s capital city. It is less than an hour from the centre of Rome, about the same from Leonardo da Vinci Airport and less than half that from Ciampino Airport. The major highlight of the immediate area is the Parco dei Castelli Romani/ Park of the Roman Castles, a 15,000 hectacre protected zone with much beautiful scenery, much animal & plant life, hiking trails, two major lakes and a wealth of historical sites including Roman ruins, old monasteries, renaissance era villas and more. Lanuvio Train Station is just 4 km away from the farm and transfers can be arranged from there as well as from the city centre and from both airports.